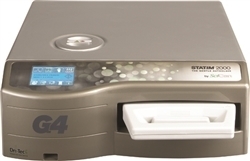 The STATIM 2000 G4 Cassette Autoclave of communicating directly with service personnel. The 2000 G4 Cassette Autoclave, through its LCD touch screen control and networking capability, has been designed to provide you with unprecedented ease of use and puts the user in total control. A large 3.5” high-resolution touchscreen offers a vivid display of messages and current cycle information all with extraordinary clarity.